Announced back in September, the second model to the OM-D range doesn’t replace the original E-M5 model but sits above it as a camera intended for serious enthusiasts as well as professional use. 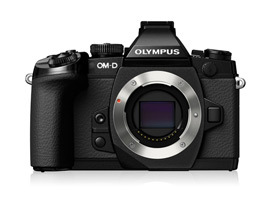 Olympus also decided to end the 4:3 E-system cameras, replacing the top of the range E-5 DSLR with the E-M1. Improved AF compatibility with the firm’s highly respected E-series lenses was achieved by adopting a 16-Mpix L-MOS sensor with on-chip phase detection pixels, giving the E-M1 two individual AF systems. However, because of the longer register, E-series lenses aren’t native to the mirrorless E-M1 and an optional mount (MMF-2/3) is required. The E-M1 adopts a durable outer-shell with a proliferation of controls for direct access to features and a move away from the more-menu centric operation of the E-M5. It has also an upgraded viewfinder with a high-resolution 2.3-M dot display and expansive view plus a modified shutter with a top 1/8000th sec shutter speed and a maximum flash sync of 1/320th sec. Like other cameras with hybrid sensors, the E-M1 doesn’t have an anti-aliasing (AA) filter. Not only does this improve contrast slightly, aiding focus accuracy with the on-chip phase-detection elements, but it also improves sensor resolution with the benefit of increased sharpness and clarity in images. 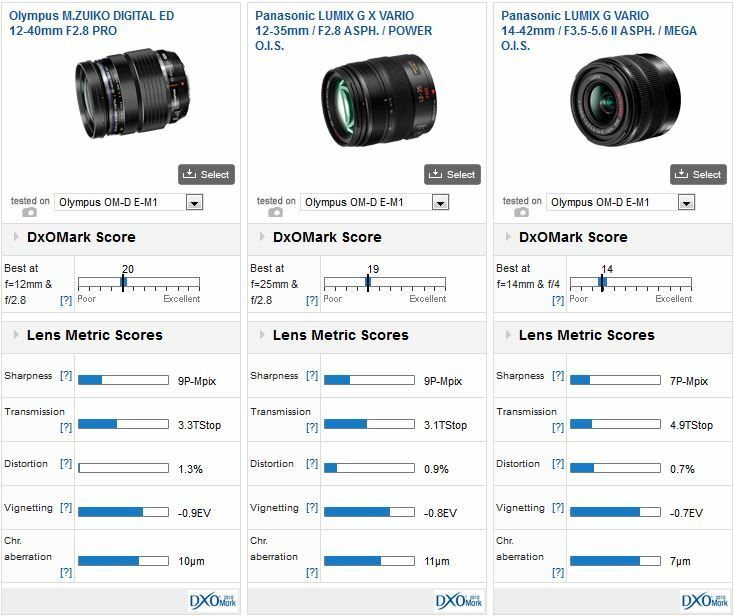 For this round up we’ve not tested the earlier E-series lenses on the E-M1 but we have analyzed the optical characteristics of 33 different MFT lenses from both Olympus and Panasonic, as well as some from third-party makers. We’ve scrutinized a total of 18 zooms, recently adding the new high-grade ED 12-40mm f2.8 Pro from Olympus and 15 primes, including the modestly priced trio of DN Art series models from Sigma and the recent update to the highly regarded 20mm f1.7 ASPH ‘pancake’ type standard lens from Panasonic. 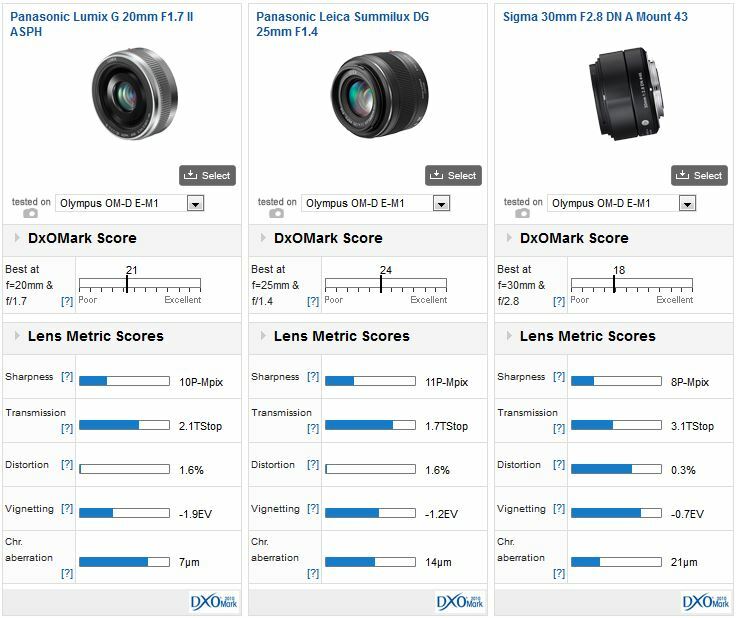 With a convincing lead of three points over the next best lens in our database of MFT primes, the top-performing model is the M.Zuiko Digital 75mm f1.8 with a DxOMark lens score of 27 points and a 12-P-Mpix sharpness score. With the 2x crop factor of MFT sensors this unmatched model is the equivalent to a 150mm – considered slightly too long for indoor portraits but there should be no concerns outdoors or when used for indoor sports. Ranked second in our database on the E-M1 is the Leica-designed fast standard 25mm f1.4 with its distinctive look, high peak sharpness and an excellent overall DxOMark score of 24 points. In third place is the modestly priced M.Zuiko 45mm f1.8. This tiny little model is highly regarded as a portrait lens and is quite sharp when stopped down to f2.8. The previous best performing zoom has been pushed to second place by the new 12-40mm f2.8 Pro from Olympus. This was launched with the E-M1 and while it’s a great performer optically there’s not much between it and the slightly shorter range Panasonic. In third place is the Panasonic’s sibling, the 35-100mm (70-200mm equivalent). Despite the longer focal lengths this model has slightly higher average peak sharpness, but at $1,300 it’s aimed at professionals and enthusiasts. Any of the lenses in this category would make fine portrait lenses but we’ve elected to compare the top two performing models, and the Leica designed 45mm f2.8 on account of its field of view and additional macro capabilities. Although it has a wide-maximum aperture the 75mm is the best optically and it’s without doubt the sharpest of the group. It’s sharp at the initial aperture and improves when stopped down – the gains being made mostly in the outer field. However, it’s quite a large lens for an MFT model. Between the 45mm models, the Leica is the larger of the two but that’s hardly surprising given the built-in stabilization and macro capability. It also pushes the price up considerably. 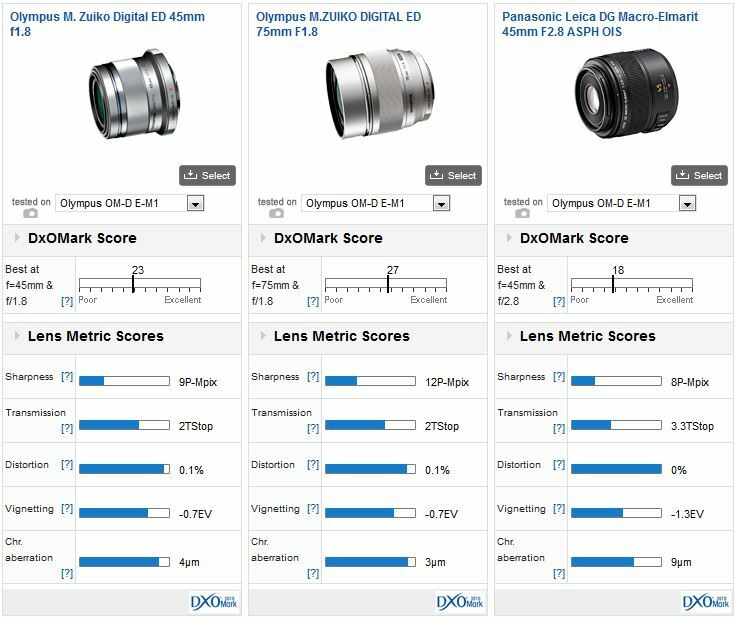 Image quality is close however while the Leica has better uniformity, the Olympus has higher center sharpness. The Leica also has quite high levels of CA for a macro model but it’s unlikely to be an issue for headshots. Although the Leica designed 25mm f1.4 has a DxOMark score of 24, compared with 21 points for the new 20mm f1.7 II upgraded model from Panasonic the image quality is closer than you might think. The same goes for the Sigma 30mm f2.8. It’s a good performer optically when compared with the 20mm f1.7 but there’s quite a gap when comparing the Sigma with the Leica 25mm. Be that as it may, the Sigma may not have the benefit of a large maximum aperture but it’s sharp wide-open, albeit in the center. At the same aperture the other two are sharper still and Leica is far ahead in corner sharpness by then. As well as the advantage in Transmission of the Leica it has good control of vignetting unlike the new 20mm, however that has the lowest chromatic aberration of the three. In fact CA is somewhat troublesome on the Sigma with it being noticeable in the outer 50% of the field (i.e. the periphery, edges and corners). Based on price and performance, the new 20mm f1.7 might not perform quite as well as its illustrious predecessor but out of the three models it’s probably the best value. Launched with the E-M1 was the first pro-level zoom lens from the firm. While it has taken a long time, it was well worth the wait. At $1,000 the M.Zuiko Digital ED 12-40mm f2.8 Pro undercuts Panasonic’s similar 12-35mm f2.8 ASPH but it has no need for stabilization (the E-M1 has it built-in). It also has similarly high IQ for a wider zoom range but it performs differently. The Panasonic has slightly better center sharpness at the longer focal lengths, but the Olympus has better uniformity across the frame at wider apertures, particularly at the shorter end of the zoom range. The Olympus is not great wide open at 40mm but it improves significantly when stopped down only one stop to f4. In most other respects the two models perform similarly. The Panasonic has a slight edge in transmission though the Olympus is slightly more consistent throughout the range. However, there’s little need to choose one over the other, unless image stabilization is a concern (with the exception of the GX7, Panasonic bodies don’t have it built-in). Compared with the Panasonic 14-42mm f3.5-5.6 II ASPH zoom there’s a big difference in image quality but that model is a good performer for a kit lens. Like most zooms it’s sharper in centers at the shorter end but it’s not bad if you’ve no need of the performance, brightness or build of the other two. If you have an Olympus OM-D EM-1 and a favorite lens, we would very much like to hear from you. Please leave a comment below, stating what lens it is and why you like it.